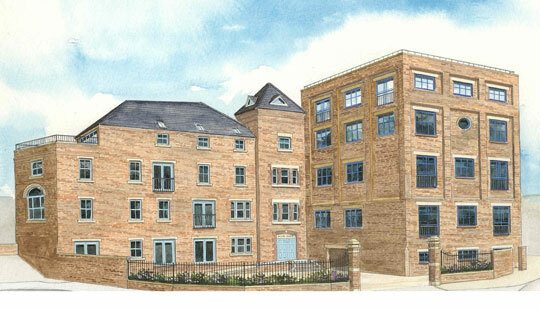 A high quality residential conversion of a former brewery building, on the edge of Wrexham Town Centre. Comprising 16 high quality residential apartments, a parking space per apartment, secure courtyard with automatic gates and improvements to the Tuttle Street access. J-Ross Developments Ltd acquired and secured thorough planning consent for the site of 817 m² (8798 sq.ft) and negotiate WDA Town Improvement Grant funding for an enhanced external works package. The project required specialist conservation area consultations due to the schemes location, adjacent to St Giles’ Church (Grade I) and The Nags Head (Grade II). This involved the production and efficient delivery of conservation area analysis. Extensive pre-application meetings were held with WCBC stakeholder team to secure acceptable planning consent. Discussions were also held with WCBC and WDA to secure TIG funding for the enhanced external works and an agreement with the County Highways Department was reached, a S.278 agreement was obtained in order to improve the road access.